As the evenings are going to become a bit more crisp over the next month, it’s time to look at getting your hands on a nice dress scarf. It is such a touch of class when dressing for a formal affair. It can be worn strictly functional for weather and hung with your coat. However, the best use of a dress scarf is when you leave it on, to dangle under your suit jacket. This is not a thing you can try in every situation but for those nights you need to look important, nothing says “on the go” like keeping your scarf around your neck. 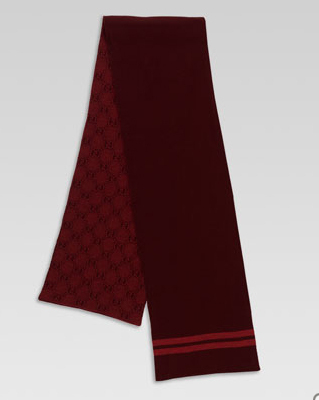 This piece from Gucci has the traditional double G pattern and their signature stripes. In brown and wine, 100% wool, get it online here. This entry was posted in Accessories, News and tagged GG. Bookmark the permalink.